Discovering Evan Dorkin in my late teens may not have been the best thing for me. That point in your life is when you’re supposed to start Growing Up, and I was doing an OK job of it… and then I found Hectic Planet. I’m not going to say it’s completely responsible for my spending the last few decades with a maturity level stuck at roughly twelve years old, but it was certainly a contributing factor. It’s in this general spirit that I regularly seek out and eat novelty “food” items, most of which are Very Bad For Me. That’s your rainbow frappucinos, your grossly-oversized burgers, your deep-fried-anything. Fair food. Frankly, it’s a wonder I’ve lived this long. 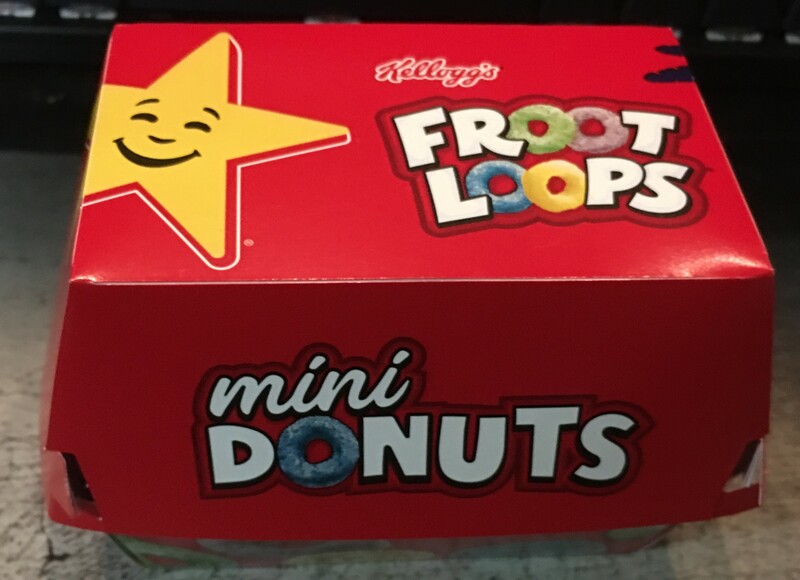 Anyway, Carl’s Jr is currently selling a limited edition dessert item consisting of a box of Froot Loops-themed mini donuts, and I would like to be very clear that I was actually sort of being an adult here. I did NOT go to Carl’s Jr to buy a box as soon as I found out about them. On the other hand, when my wife asked me if I wouldn’t mind stopping at their drive-thru window so I could bring home burgers, well… obviously it was a sign. Froot Loops were always a favorite cereal of mine when I was a small lad, and I have fond memories of getting up early on Saturdays to watch cartoons and pound down bowl after bowl of, basically, a shaped and brightly-colored sugar substrate. I have less fond memories of the first time I actually made myself sick in the process. But let us continue. 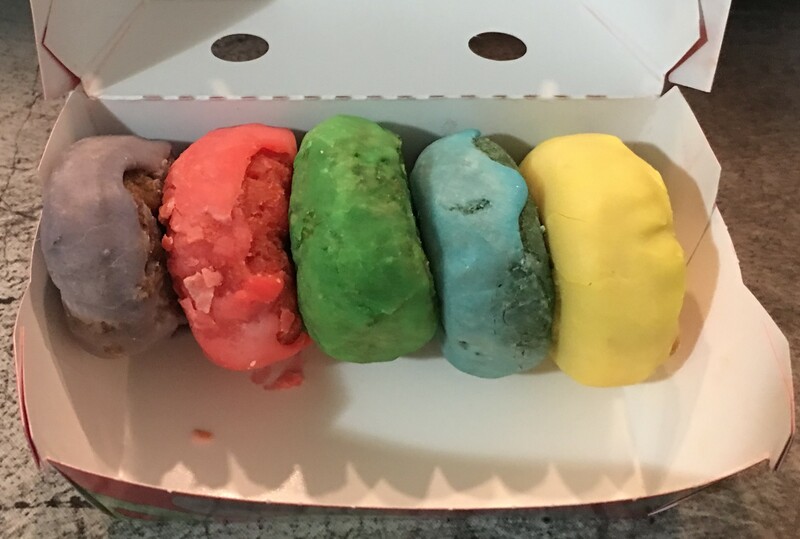 What you get for your money is five tiny donuts in gloriously brilliant shades of neon. Hilariously, when I went to find the nutritional information for these things on the Carls Jr web site, I found them filed under “breakfast sides” and not “desserts”, which is, um, creative if nothing else. I guess it’s because they’re cereal themed, but the Dave Berry gag about “part of a balanced breakfast” has never seemed more appropriate. For the record, the box of donuts is 320 calories – less than a package of Pop Tarts – so it’s not the absolute worst thing you could be eating. Take that to heart as you order your own box. I expected… well, I expected the worst, to be honest. I have never been a fan of Hostess Donettes, and that’s what these kind of look like. I also haven’t eaten the cereal these are based on since those days of Saturday morning cartoons, so I was expecting to have some last bits of my childhood ruined. With that last bit in mind, I cannot say for certain whether these actually taste like Froot Loops cereal. I CAN say that they have a taste and smell that is 100% faithful to my MEMORY of Froot Loops, so at the very least they are powerful nostalgia bombs. As a display of self control, I actually did offer my wife one. Since she is far more of an adult than I will ever hope to be, she graciously declined. Her loss. I probably shouldn’t go back to Carl’s Jr until these things have left the menu. The urge to buy a couple of boxes and bring them home and pour milk on them is strong, and I think – no, I am certain – that I would regret the experience.